Captaining a World War II Army surplus amphibious vehicle is not your average day job. Ride along with Gulf Coast Ducks and the brave souls who pilot the double splashdown. They are the few, the proud, the duck boat captains. They drive on land and plunge into the Mobile River deliberately, men and women with their ducks in a row. Since June 2016, the splashdowns of Mobile-based Gulf Coast Ducks have numbered in the thousands. 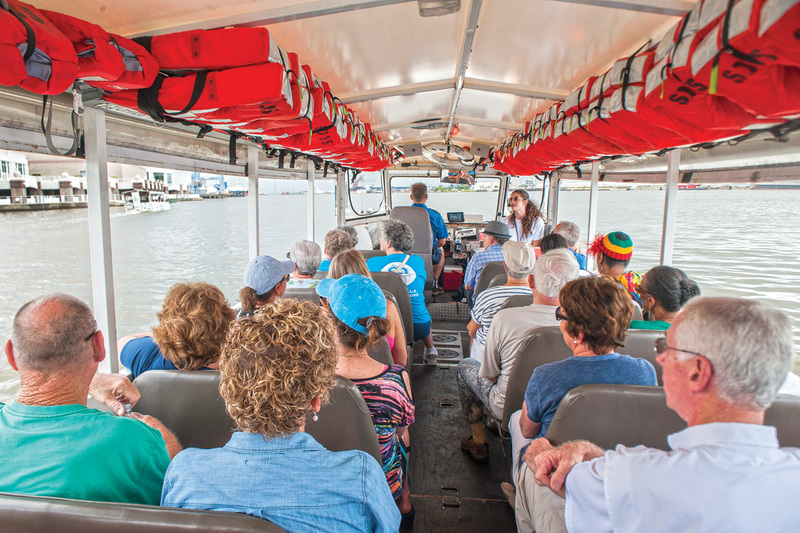 The three-boat fleet of amphibious crafts runs weekly, daily, hourly, sending up to 105 passengers into and out of the River and Bay every 60 minutes — safely and happily. Other vessels respond, “Affirmative,” and list activities in progress and locations. Weather conditions are checked. If everything is a go — splash! Ten minutes ago, the craft was an ambling land vessel on Government Street. Now, it is a passenger craft in Mobile Bay. Captain Jessica Yeager shows off the interior details of the World War II vehicles. Meanwhile, a tour guide like Kat Thomasson conducts the adventure, explaining facts, statistics and trivia about the Port City that even seasoned natives may not know. Peppered among the facts are jokes and sing-along ops, such as a rollicking chorus of “Sweet Caroline,” complete with accompanying duck whistles (quackers are a bargain $3 souvenir). But like the other tour guides, Kat is more than humorous and informative. 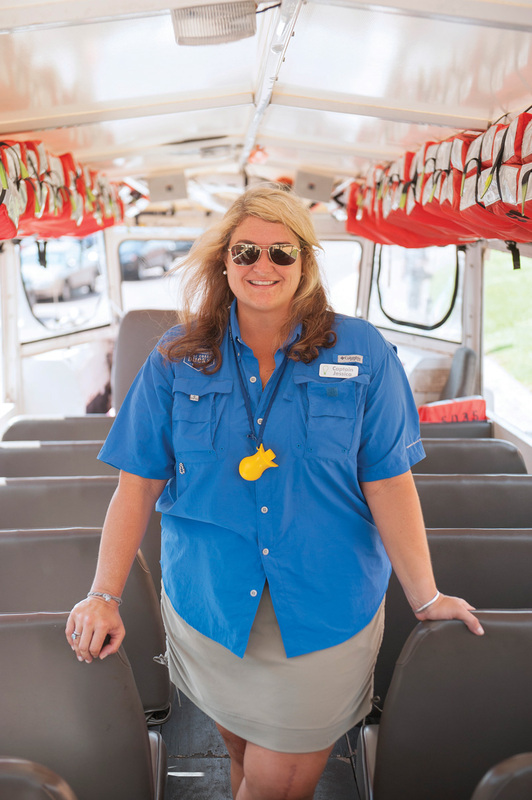 Tour guides are trained on basic duck boat maneuvers. In the event something happened to the captain, Kat would take control. She would pilot the boat back to land. Captains have a Class B CDL license and a Captain’s license for 25 ton or bigger vessels. 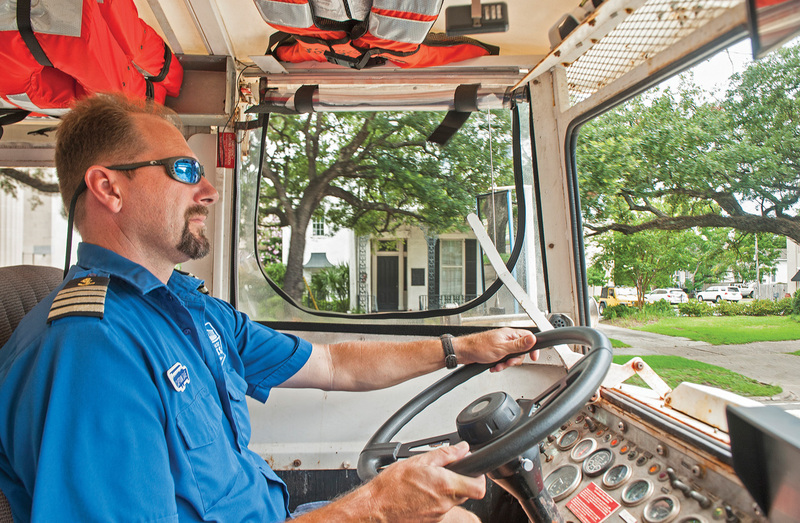 In addition, there is annual first aid and CPR training and instruction specific to Mobile’s duck boats. Each vessel is inspected twice daily — once before the first morning departure and once after the day’s final voyage. Captains crawl under the craft, looking for potential problems, damage and concerns. They work closely with the company’s full-time mechanic. A Gulf Coast Ducks boat propels through the Mobile River with a full group of passengers onboard. Shoreside runs have challenges, too. Land tours include the Oakleigh District, Dauphin Street, Bienville Square, Cathedral of the Immaculate Conception and other areas where traffic is occasionally heavy. Try navigating it in a 31-foot, 26,000-pound land-water rover with 35 passengers — 20 of them blowing duck whistles. “We train for that,” smiles Captain Dave. Gulf Coast Ducks • 11 a.m., 12:30 p.m., 1:30 p.m., 2:30 p.m., 3:30 p.m., 4:30 p.m., 6 p.m. daily. Departs and returns from the Fort of Colonial Mobile, 150 S Royal St. • Run time 70 minutes • $29 for adults; $26 for seniors, military and educators; $16 for children; $3 for infants • Tickets can be purchased online in advance or at the ticket office in the Fort of Colonial Mobile within one hour of the tour’s start time.